When you’re in love with the N.I.Z. 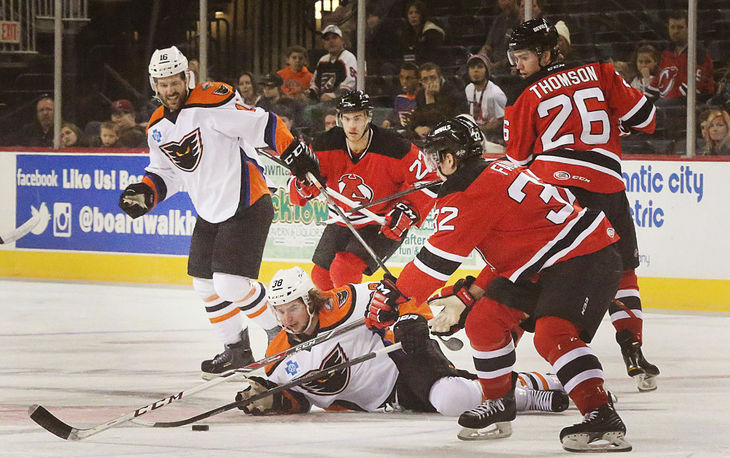 A pair of power play strikes, the second of which arrived during a six-on-four situation rather late in the contest, were never really enough to dig the home side out of the three-goal hole it had dug for itself in the first two periods as the up-and-down Lehigh Valley Phantoms lost to the visiting Springfield Falcons in “edge-of-your-seat” American Hockey League action on a snowy Weather Emergency Disaster Catastrophe Crisis night in downtown Allentown’s dazzling and sparkling Neighborhood Improvement Zone. NOTES — the Phantoms had been expected to give 33-year-old veteran Rob Zepp (2.43 avg, .921 svpct) his thirteenth start in goal this season but the Germany national team netminder suffered a vague “lower body injury” during the pre-game warmups and, thus, gave way to 20-year-old rookie Anthony Stolarz, the second round pick (# 45 overall) of the Philadelphia Flyers at the 2012 NHL Draft who had a shutout of Lehigh Valley in his last AHL appearance. The Springfield Falcons featured Domenic Monardo, the 26-year-old out of Lake Superior State University who to training camp with the Lehigh Valley Phantoms this fall but was then assigned to the Reading Royals of the third-tier East Coast Hockey League by the Philadelphia Flyers organization. Rather than report to Reading, where the Canadian legionnaire scored 27 goals in 70 ECHL games as a rookie last season, Monardo inked an AHL tryout contract with Springfield on October 2nd. The signing has paid dividends for the Falcons already, with Monardo having accumulated five goals and seven points in his first 14 AHL games thus far. The game-winning goal for Springfield was ultimately credited to veteran American defenseman Jamie Sifers, the 31-year-old from the University of Vermont who has skated in 37 games for the Toronto Maple Leafs and Minnesota Wild in his career but has spent the past three seasons skating in the Deutsche Eishockey Liga for German club Adler Mannheim. Michigan center J.T. Compher (7), the 19-year-old sophomore from Northbrook, Illinois, who was the second round selection (# 35 overall) of the Buffalo Sabres at the 2013 National Hockey League Draft before leading the Wolverines in both assists and scoring as a freshman (35 ga, 11 go, 31 pts) last season, notched his first two goals of this 2014/15 NCAA campaign in the third period of the lopsided win over the visiting Penn State Nittany Lions at the venerable Yost Ice Arena in Ann Arbor. 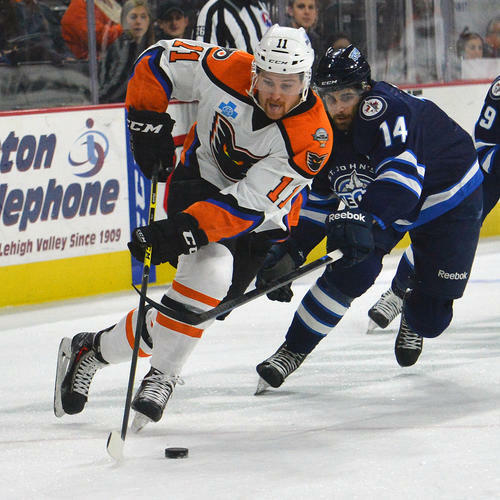 A little give-and-go in the offensive zone and a well-taken backhander at close shortly thereafter enabled the visiting St. John’s IceCaps to nip the Lehigh Valley Phantoms 2-1 after extra time in the American Hockey League. 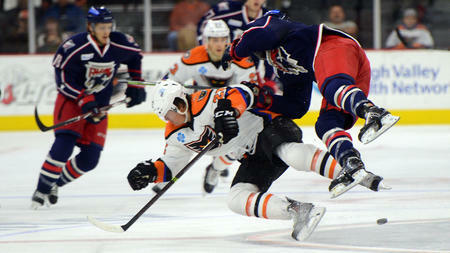 Lehigh Valley opened the scoring almost a baker’s dozen minutes into the first period on a backhander from left wing Petr Straka, the 22-year-old import from the Czech Republic who was the second round choice (# 55 overall) of the Columbus Blue Jackets at the 2010 National Hockey League Draft, after Phantoms hard man Zack Sortini, the seasoned 29-year-old pugilist who has already accumulated nearly 2,000 penalty minutes in his professional career, had been stopped in front; it was the fourth strike of this season for the speedy Straka (14 ga, 8 pts), who is on pace to exceed his offensive production for the Adirondack Phantoms (60 ga, 9 go, 27 pts) last season. St. John’s equalized rather early in the second period when defenseman Brenden Kichton, the 22-year-old Canadian legionnaire who put up solid numbers (76 ga, 10 go, 48 pts) for the IceCaps as a rookie after being taken in the seventh round (# 190 overall) of the 2013 NHL Draft by the Winnipeg Jets, blasted a rising slapshot from the right point into the upper far corner of the Lehigh Valley net. The Phantoms had plenty of chances to retake the lead as the St. John’s attack went ice cold in the final frame but Lehigh Valley were unable to put another puck past IceCaps goaltender Connor Hellebuyck, the 21-year-old rookie from Commerce, Michigan, who was tabbed by the Winnipeg Jets in the fifth round (# 130 overall) of the 2012 NHL Draft and starred for two seasons at the University of Massachusetts at Lowell. Despite having been heavily outshot (10-2) in the third period, the St. John’s IceCaps snatched the winner in overtime when veteran defenseman Julien Brouillette, the 27-year-old Canadian legionnaire who appeared in 10 NHL games (1 go, 2 pts) for the Washington Capitals last season, exchanged passes with countryman Eric O’Dell, the 24-year-old center who skated in 30 NHL games (3 go, 7 pts) for the Winnipeg Jets last term, before skillfully lifting a backhander over the near-post shoulder of Lehigh Valley Phantoms goaltender Rob Zepp (12 ga, 2.43 avg, .921 svpct) at close range. 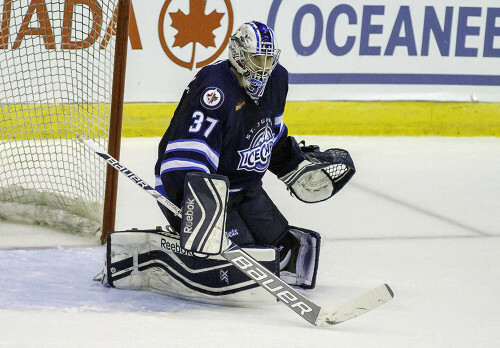 St. John’s IceCaps goaltender Connor Hellebuyck, who was named the Hockey East Tournament Most Valuable Player as a freshman in 2013 and a First Team (East) All-America as a sophomore for the UMass/Lowell River Hawks last season, has been in fine form (13 ga, 2.61 avg, .921 svpct) at the start of his professional career. Thanks to a sensational performance between the pipes from a first-year professional who was making his season debut on home ice, an initial strike inside the first one hundred and four seconds of the game combined with a shorthanded goal less than ten minutes later would be more than enough as the resurgent Lehigh Valley Phantoms shutout the visiting Worcester Sharks 4-0 in the American Hockey League. Rookie Taylor Leier, the 20-year-old left wing from Saskatoon who was the fourth round pick (# 117 overall) of the Philadelphia Flyers at the 2012 NationalHockey League Draft and represented Canada at the 2014 IIHF World Junior Championships last winter, notched his fourth goal of this season less than two minutes in after taking a no-look pass from center Blair Jones. The 28-year-old veteran of 132 NHL games who was just recently demoted by Philadelphia also set up Lehigh Valley’s second goal against the Sharks after winning a shorthanded faceoff in Worcester’s offensive zone, as well. Thus, Robert Hagg, the 19-year-old defenseman who was the second round selection (# 41 overall) of the Flyers at the 2013 NHL Draft and has won two silver medals for Sweden at the annual IIHF World Junior Championships, was able to net his second goal for the Phantoms this term. 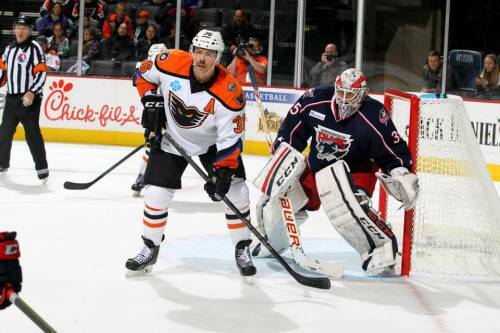 Rookie Lehigh Valley goaltender Anthony Stolarz came into the Friday night contest with Worcester having had lost his first three professional starts, none of which were on the surface at the PPL Center in Allentown, though. And the 20-year-old native of Jackson, New Jersey, who was tabbed by the Philadelphia Flyers in the second round (# 45 overall) of the 2012 NHL Draft, was able to leave those experiences in the rear view mirror while giving a magnificent performance against the Sharks. In all, Stolarz turned aside 36 shots, several of them in spectacular fashion. 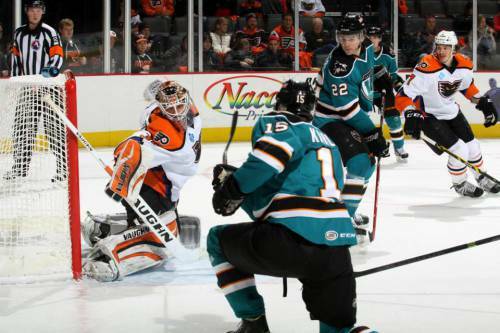 Lehigh Valley Phantoms netminder Anthony Stolarz, who posted a shutout in his only appearance for the United States at the 2014 IIHF World Junior Championships in Scandinavia last winter, blocks a shot from Worcester Sharks center Melker Karlsson (15), the undrafted 24-year-old rookie from Sweden, during the American Hockey League game at the PPL Center in Allentown. Despite having conceded in the opening minute of the contest, a devastating three-goal burst in the latter stages of the first period and continued standout play between the pipes lifted the surging PENN STATE NITTANY LIONS to a deserved 3-2 come-from-behind victory over the MICHIGAN WOLVERINES in the 2014/15 Big Ten Conference season-opener for both teams. 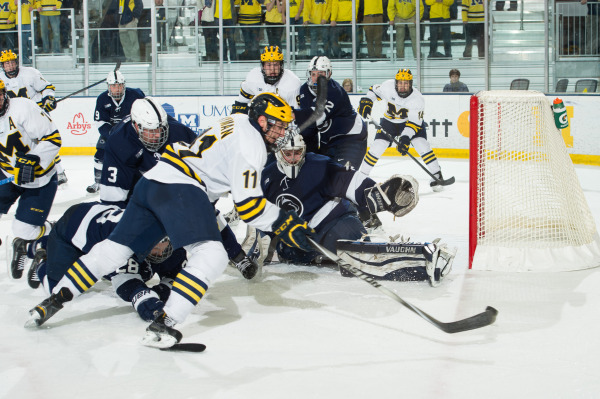 Considered by many to be the second-best team in the Big Ten Conference going into the season, the Wolverines (4-6-0) have made a rather slow start this fall but required only 46 seconds to jump on top of the visiting Nittany Lions as left wing Max Shuart, 20-year-old homegrown sophomore from Northville who went pointless in eleven games as a freshman last term, pounced on a loose puck to score his third goal in Michigan’s last four games. Penn State (7-2-2) needed just over fourteen minutes to get the first puck past Wolverines goaltender Zach Nagelvoort, the 20-year-old homegrown sophomore from Holland who was tabbed by the Edmonton Oilers in the fourth round (# 111 overall) of the 2014 National Hockey League Draft this past summer. With the Nittany Lions operating on the power play, a one-time shot from red-hot right wing Casey Bailey from the top of the left faceoff circle deflected off the skate of center Max Gardiner, the 22-year-old redshirt senior from Deephaven, Minnesota, who was the third round choice (# 74 overall) of the St. Louis Blues at the 2010 NHL Draft, standing in front. It was the second goal of this season for Gardiner, the transfer from the University of Minnesota who went goal-less in 22 games for Penn State last season. Michigan Wolverines captain Andrew Copp, the 20-year-old homegrown junior from Ann Arbor who was plucked in the fourth round (# 104 overall) of the 2013 National Hockey League Draft by the Winnipeg Jets and represented the United States at the 2014 IIHF World Junior Championships last winter, is confronted along the wall by Penn State goal-scorer Max Gardiner (27) as well as Nittany Lions defenseman Erik Autio (20), the 19-year-old freshman from Finland. 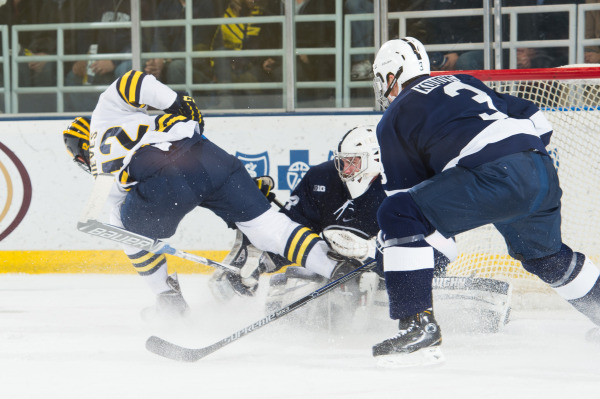 The Nittany Lions grabbed the lead less than twenty seconds after equalizing when right wing Eric Scheid stole the puck from near the blue line in his own defensive zone and then split a pair of Michigan defenders before racing the length of the ice. The 22-year-old redshirt junior from Blaine, Minnesota, who transferred from the University of Alaska – Anchorage then beat Nagelvoort on the backhand to notch his seventh goal of this season. Scheid has now scored 18 goals in 47 NCAA games since first donning the sweater for Penn State. 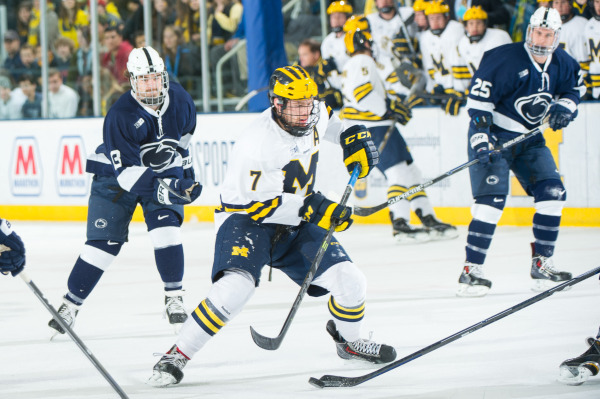 Bailey struck for the Nittany Lions’ third goal in under three minutes after easily picking the pocket of careless Wolverines defenseman Kevin Lohan, the undrafted 21-year-old sophomore from Cold Spring Harbor, New York, at the left point in Michigan’s offensive zone. The 22-year-old junior from Anchorage, Alaska, who now counts 32 goals in 70 career NCAA games for Penn State, skated all the way down the right side before using a slick toe-drag move to cut in between the faceoff circles and snap the puck past the shell-shocked Nagelvoort. Bailey’s ninth goal of this season gave the surging Nittany Lions a 3-1 lead it would never relinquish. This because Penn State netminder Eamon McAdam, the 20-year-old homegrown sophomore from Perkasie who struggled through a difficult freshman campaign last season, continued to display the kind of form that made the New York Islanders want to choose the youngster in the third round (# 70 overall) of the 2013 NHL Draft in the first place. 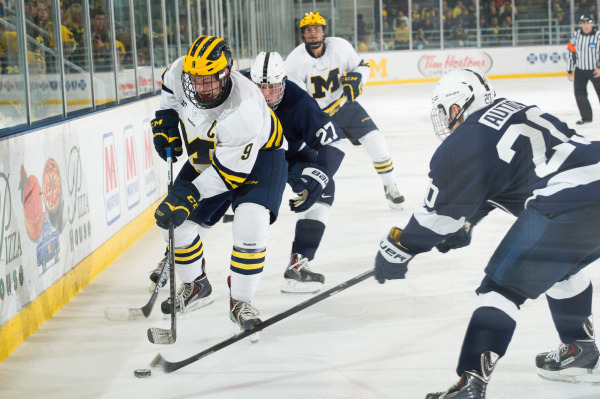 Michigan defenseman Michael Downing, the 20-year-old sophomore whom the Florida Panthers plucked in the fourth round (# 97 overall) of the 2013 NHL Draft, pulled a goal back for the Wolverines early in the third period but it made little difference. Since coming off the bench against the highly ranked UMass/Lowell River Hawks in the first of last weekend’s two-game set, the recalled McAdam has stopped 79 of 83 shots faced for a remarkable .952 save percentage in three appearances this season. Michigan Wolverines right wing Cristobal Nieves (12), the 20-year-old junior from Baldwinsville, New York, who was the second round selection (# 59 overall) of the New York Rangers at the 2012 NHL Draft, is prevented from scoring at point-blank range by Penn State goaltender Eamon McAdam as Nittany Lions defenseman Patrick Koudys (3), the 21-year-old redshirt senior who was the fifth round choice (# 147 overall) of the Washington Capitals at the 2011 NHL Draft, during the Big Ten Conference season-opener at the Yost Ice Arena in Ann Arbor. 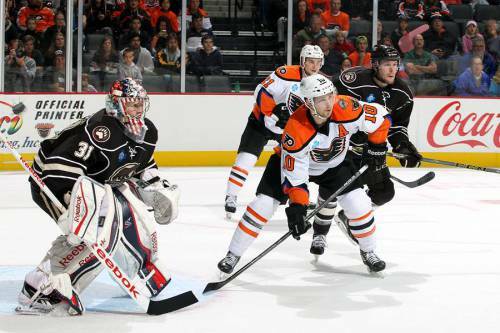 On the very same night that found the two opposing Germany national team goaltenders to be in excellent form, it was only a solitary goal from the recently demoted National Hockey League veteran during the shootout phase that could separate the two American Hockey League intra-state rivals as the Lehigh Valley Phantoms outlasted the visiting Hershey Bears 3-2 in the latest installment of the 2014/15 William Penn Cup competition. Despite having its leading goal-scorer just recalled by the parent Philadelphia Flyers the day before, the Phantoms struck twice within the first seven minutes of game against Hershey goaltender Philipp Grubauer, the 22-year-old who was the fourth round choice (# 112 overall) of the Washington Capitals at the 2010 NHL Draft and certainly did alright for himself in 17 NHL games (2.38 avg, .925 svpct) last season. 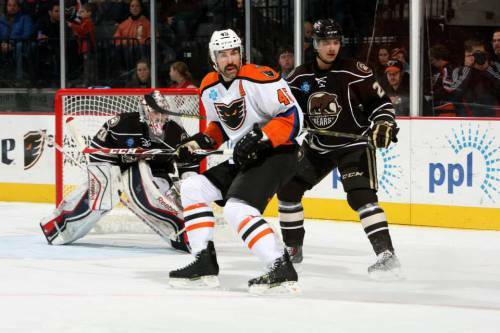 Lehigh Valley center Blair Jones, the 28-year-old veteran who was just demoted by Philadelphia after appearing in only four NHL games this fall, located Andrew Gordon at the far post and the 28-year-old right wing out of St. Cloud State who spent four seasons with the Hershey Bears previously easily netted to notch his 150th career AHL goal. Roughly three and a half minutes later, Phantoms rearguard Brandon Manning made good use of an effective screen from the physical Zack Sortini to score his third goal in as many games, a remarkable achievement for any player in this day and age, let alone a defenseman at that. Lehigh Valley absolutely dominated the first period and would have widened their lead even further if not for the fine work of Grubauer, who made 18 saves in the opening twenty minutes alone. Hershey, who had the better of play in both the second and third periods, got back into the game after going on the power play towards the end of the middle frame. Well-traveled left wing Dane Byers, the 28-year-old Canadian legionnaire who was the second round selection (# 48 overall) of the New York Rangers at the 2004 NHL Draft but has only ever skated in 14 games at the elite level of North American pro hockey, went to the front of the net and banged home a center pass from right wing Chris Conner, the 30-year-old journeyman from Michigan Tech University who has skated in 178 NHL games (22 go, 50 pts) in his career. The Bears brought themselves level just three and a half minutes into the last period after a rush that was started by defenseman Conner Carrick, the talented 20-year-old who spent most of last season with the Washington Capitals (34 ga, 1 go, 6 pts) and also represented the United States at the 2014 IIHF World Junior Championships in Sweden; former Adirondack Phantoms center Kris Newbury, the 32-year-old American Hockey League veteran who now has 509 points (170 goals) in 678 career AHL games finished with aplomb to net his league-leading 10th goal of this season. The duration of the contest developed into a genuine duel between two goaltenders who each started multiple games for Germany at the 2014 IIHF World Championships last spring. Lehigh Valley netminder Rob Zepp, the reliable 34-year-old veteran who appeared in four games for Deutschland at the annual IIHF affair last season, needed to make a big save on a breakaway by Hershey center Chandler Stephenson, the 20-year-old rookie who was tabbed in the third round (# 77 overall) by the Washignton Capitals at the 2012 NHL Draft, late in regulation time. Meanwhile, Grubauer, who started two games (3-2 win over Latvia, 0-3 loss to Russia) for Germany in Belarus last spring after Hershey uncharacteristically missed the playoffs last term, was continuously challenged in overtime and would finish the contest with an impressive 37 saves. The Bears were certainly unlucky to have Michal Cjakovsky, the undrafted 22-year-old defenseman who skated for Slovakia at the 2012 IIHF World Junior Championships and was named to the East Coast Hockey League’s All-Rookie team last season after scoring 14 goals in 66 games for the Reading Royals last term, clank his shot off the iron in extra time. 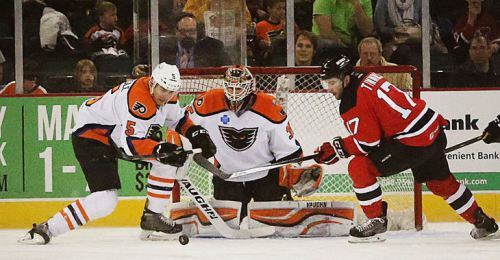 On hand to clear the puck off the line was Phantoms defenseman Robert Hagg, the 19-year-old rookie who earned a silver medal for Sweden at the 2014 IIHF World Junior Championships last winter. It was the second time in as many games that the Philadelphia Flyers’ second round pick (# 41 overall) at the 2013 NHL Draft made a critical defensive play very late for Lehigh Valley. 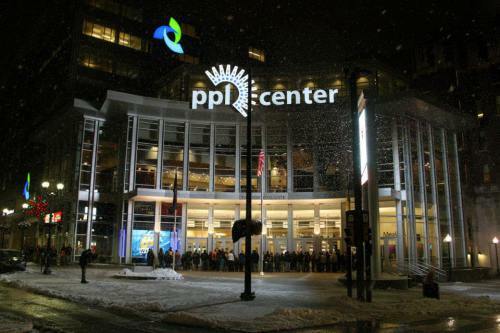 And so it was off to the shootout for the very first time at the newly-constructed PPL Center in downtown Allentown. The Phantoms required only two penalty shot attempts with the newly-arrived Jones, who has skated in 132 NHL games (7 go, 17 pts) in his nine-year pro career, capped off his Lehigh Valley debut by netting what would prove to be the winner. 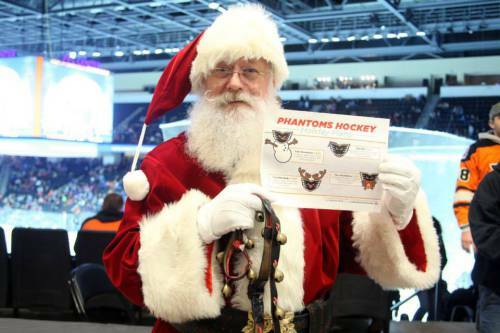 This because the workhorse Zepp, who has started eleven (2.48 avg, .921 svpct) of the Phantoms’ fourteen AHL games this season, was able to halt all three of Hershey’s shooters and procure Lehigh Valley the extra point in the offical league standings. Notes — the Phantoms must now soldier on without leading goal-scorer Scott Laughton (13 ga, 6 go, 11 pts, -4 def rat), the first round pick (# 20 overall) of the Philadelphia Flyers at 2012 NHL Draft who captained Canada at 2014 IIHF World Junior Championships last winter. 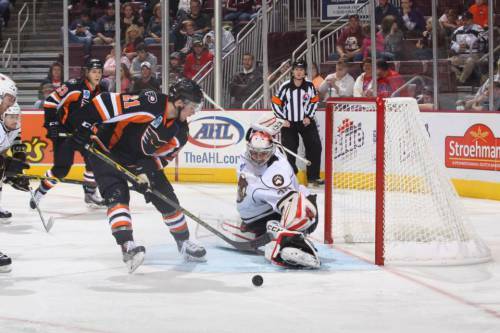 The injury-hit Hershey Bears were missing two key veteran blueliners against the Lehigh Valley Phantoms. Jon Landry, the 31-year-old Canadian legionnaire from little Bowdoin College (NCAA Division III) who had a brief spell with Koelner Haie in the German elite league a few seasons back, leads all Hershey players with a + 9 defensive rating in 14 games (1 go, 3 pts) this season. Mike Moore, the 29-year-old Canadian legionnaire out of Princeton University who has six NHL games for the San Jose Sharks under his belt and captained the AHL’s Providence Bruins last season, has been out with an injury for a little while now. Jawohl, ist richtig. Wir haben endlich drei Mannschaften aus dem American Hockey League, die aus Pennsylvania kommen. Jetzt koennen wir ein echte Staatmeisterschaft in diesem Jahr spielen! Morgen Abend gibt es ein andere Staatderbyspiel bei unserem Palast des Sports. Noch einmal, besuchen die Hershey Bears mit ihrem deutschen Torhueter Philipp Grubauer, der 22-jaehrige mit siebzehn NHL-Auftritten fuer die Washington Capitals im letzten Saison. Hershey sind Tabellespitzen in diesen Tagen, im Rennen um die Eishockey-Staatmeisterschaft. Jede Mannschaft wird gegen die beiden anderen Mannschaften aus Pennsylvania zwoelfmal dieser Saison schlittschuhlaufen. Jede Mannschaft wird am Ende der AHL-Zeitplan in gesamt vier und zwanzig Ergebnisse von Staatmeisterschaftspiele haben. Und dann der Eishockey-Koenig unseres Lands gekroent werden koennen. Schwer zu sagen, ob wir sehen morgen ein andere Duell der deutschen Torhueter, wie das letzte Spiel bei unserem Palast des Sports zwischen Hershey und Lehigh Valley brachte. Ehemaliger Eisbaeren Berlin-Torwart Rob Zepp hat bereits zehn mal gespielt und es ist moeglich, dass die Philadelphia Flyers wunschen mehr Einsatz fuer der junge Anthony Stolarz. Bisher haben die Hershey Bears ein Rotationsystem benutzt und der deutsche Laenderspieler Grubauer kam gut am Sonntag.